I’m on the road today, but I wanted to post something. 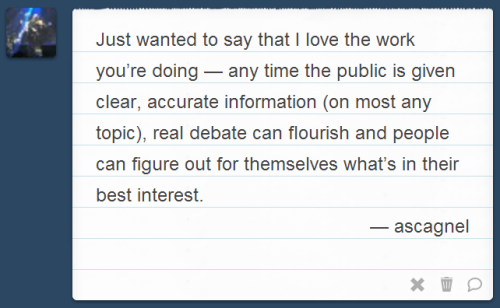 So I’m going to cheat and cut-and-paste some recent Q&A posts from my Tumblr. If you’re looking for a longer read, go check out my comic, which just completed a long section involving how the Fourth Amendment plays out during different kinds of car stops. I don’t know all the facts, of course, and I’m not a Florida lawyer, but from what I’ve read it seems to me like the defense doesn’t have a winning argument here. It’s not unethical to make a losing argument, and lawyers often feel obligated to make every conceivable argument rather than lose an issue for appeal, or in the hope that something sticks — but it might be better to preserve your credibility with the court by choosing those arguments that at least have a teeny bit of merit. “Stand your ground” laws say that, if you’re lawfully where you are, and someone is then and there about to kill or severely injure you, then even if you could have gotten away safely you’re allowed to use deadly force to defend yourself. The “Bush Doctrine” is an application in international law of a basic principle of self-defense: you don’t have to wait for the other guy to hit you first before you defend yourself from the coming blow. From what I understand of the Woodward case, he felt intimidated by these people, but was not in any immediate danger. Nobody was coming at him. Nobody was presently any threat to him. Instead, he snuck up on a group of people at a barbecue, crawling on his belly to avoid detection. Then he fired a mess of rounds at them, hitting three and killing two. I don’t know what kind of weapon he had, but if the reported numbers of rounds are accurate, then he must have stopped to reload a few times. This was not self-defense, because he was not in any actual danger at the time. At best, he was defending against some imagined possible future attack that might never have come. I get that he felt terribly harassed, but that’s not the same thing as an actual imminent attack. A hypothetical future attack is not an imminent one. It was not stand your ground, because first of all he probably wasn’t lawfully there but was trespassing with intent to commit murder; and second of all because he wasn’t reacting to an attack. The “Bush Doctrine” is just silly to cite, when there are plenty of self-defense cases to cite involving striking the first blow. But even there, the whole point is you’re about to get hit, and you’re defending yourself by making sure that blow doesn’t land on you. From what I read, it looks like nothing less than cold-blooded premeditated murder, perhaps under great stress from a history of harassment, but in no way justified by it. Very similar to the “battered wife” scenario in my comic, actually. 1. No matter how angry you get at someone, you’re not allowed to hit them. 2. If someone else is about to hurt you for real, first try to get away. 3. If you can’t get away, try to get a grownup to help you. 4. If you can’t get help, then I want you to hit first, I want you to hit hard, and you’re not allowed to stop hitting them until they can’t hit you any more. Let’s practice some moves. I guess Woodward’s daddy never taught him that. This started out as an offshoot of my law blog, which has a similar disclaimer. It’s pretty standard for lawyers to state that their legal information isn’t legal advice, and just because you read it that doesn’t make you a client. We’re all stating the obvious when we do that. (And no amount of disclaimer would help if a lawyer actually did give legal advice.) I imagine every lawyer cringes a bit as he types one out. Nobody in their right mind needs to have this explained. But not everyone is in their right mind, sadly. You hear stories about how every now and then someone didn’t quite get the concept, which can turn into an unpleasant situation. So lawyers hope their disclaimers deter some of those people — and it’s nice to have something in black and white to point out to them. It hasn’t happened to me, though. Not yet, anyway. Or you could just… you know… try not to get arrested in the first place. Read them, and not get arrested. Yeah. That might be better. 18 USC 241 & 242 aren’t really about unlawful search and seizure or other stuff dealt with by the exclusionary rule. They’re about police seriously abusing their power. 241 is about conspiring to injure or threaten or intimidate someone, to hinder their civil rights or to retaliate against exercising their rights. 242 is about abusing their power to actually deprive someone of their civil rights. And the abuse of power has to be really severe. We’re talking about intentionally making up false evidence, intentional false arrests, sexual assaults, and severely excessive force. What’s being deterred isn’t merely violating the Fourth or Fifth Amendments, but actual criminal conduct. This goes beyond even a civil rights lawsuit. These are not charges that you could bring yourself. They’d have to be filed by a prosecutor. For a non-federal example of how states deal with it, here’s a story about a Mississippi sheriff who just got indicted the other day for similar conduct. That’s really my purpose here — to dispel all the crazy myths and misinformation that are so prevalent out there, and present the straight facts in a format that’s easy for any high school student or adult to understand. Not that I want anyone to think they have to accept how things really are. Maybe we ought to do some things differently. I like to think I’m helping people at least make informed arguments one way or the other (and I’ll be honest: I get a real thrill whenever I see people link to the comic in their online debates). And I love getting messages like this. Totally makes my day. Thanks again!